2011 - After a full car rebuild - We were later invited to take part in the Cholmondely pageant of power finishing 3rd in class and 9th overall. 2010 - Purchased Gordon Shedens ex 2001 production Ford Focus touring car. Raced the car for the first time in the blue oval series finishing 3rd class. 2009 - Started the season in the Tin Tops with the Focus running all season in the top 6. Also the championship was attracting attention of drivers from the British touring cars and Brit car. 2008 - With only a limited budget again we ran the Focus in the Tin Tops and also in the Euro saloon car championship finishing 2nd in class. The championship was also shown on Motors TV. 2007 - Entered the Classic Sports Car Club/Tin Top Championship - run under endurance rules but 40 minute races. Only having a small budget that season raced 5 rounds with the best finish of 2nd Mallory park and a 3rd at Oultan park. 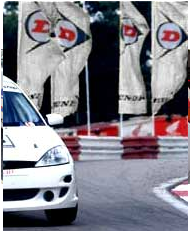 2005 - Still with the Focus we entered into the Brit Car - an endurance race championship that was televised on Eurosport. The championship runs with 2 drivers over 2 hours. We had 4 pole positions and 3 class wins two 2nd places and a 3rd place finishes in class 4. 2004 - Started the season with new Ford Focus winning the first round at Snetterton then taking 10 wins and going on to win the championship. We also took part in the Ford Saloon Car Championship as well as the season running against modified Fords and finished the season 2nd in class B.
HSG MOTORSPORT we had 7 wins four 2nd place finishes and took the championship with 1 point to spare. We entered and won a scholarship to be run in the Ford Focus Championship in 2004. 2002 - Entered the XR3I Championship - We ran the car under the Horseshoe Garage. The season was over 12 rounds at most of the UK racing circuits had the best finish of 3rd at the last round of the season at Oulton park of 4th in the championship standings. 1999 - Moved in the Super 4 championship winning 5 races finishing 2nd in a class B Southern Comfort challenge and 4th in the mbkc gold cup meeting at the end of the year. Also came 3rd at National O plate meeting. 1998 - Supplied the Honda 125cc engines in the Southern Comfort challenge class B finishing top 5 all year against class A karts and ending the year with a win and 3rd in the championship and 3rd in the mbkc championship. 1997 - Moved up to 125 cc gearbox karts and finished the season as the top rookie driver finishing in 4th place. 1996 - Season finished 2nd in junior mbkc championship with 5 wins. 1995 - Started kart racing in 100cc junior class.